Tigers run Region 4-6A record to 22-0 dating back to last season. Pictured (Front, l-r) Clay Dodson, Miles Grayson, Jordan West, and Trevon Flowers; (back, l-r) Stanford Flowers and Coach Matt Masce. Tucker, Arabia Mountain and Chamblee and paced four DeKalb County teams with undefeated records in baseball action from last week. Tucker ran its winning streak in Region 4-AAAAAA to 22 in a row over the last two years, out-scoring three league opponents by the combined margin of 40-8 last week. Coach Matt Masce’s Tigers improved to 8-7 overall, rolling past Forest Park (14-3) March 13, Charles Drew (10-0) March 14 and Charles Drew (16-5) March 16. 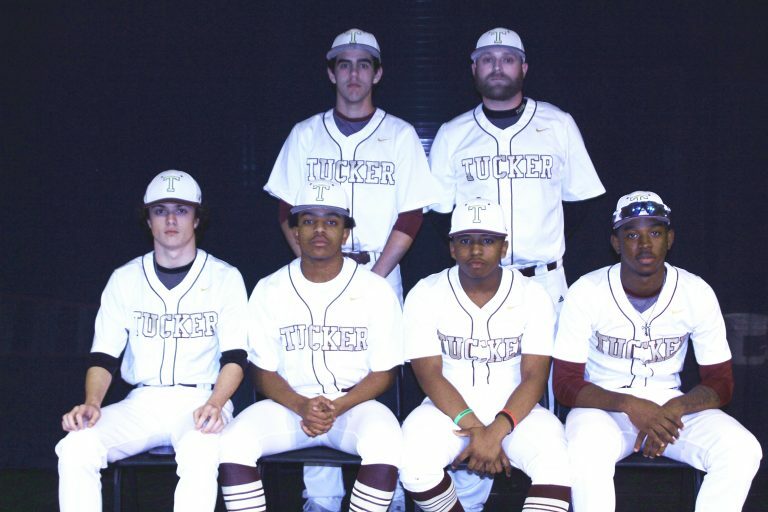 Senior Eli Owens earned the pitching triumph for Tucker in a 14-3 decision over Forest Park March 12, striking out six and allowing only four hits and one earned run over four innings. Coach Eric Hoxie’s Arabia Mountain unit stormed past Clarkston twice, winning 18-2 in an away contest March 14 and then blanking the Angoras by a 15-0 margin March 15. The Rams closed out the 3-0 week with a 12-2 victory over Southwest DeKalb March 16 to move to 9-3 overall on the year. Coach Brian Ely’s Chamblee Bulldogs continued to roll, scoring three straight Region 5-AAAAA triumphs over Columbia (3-0) March 13, Columbia (12-9) March 14 and Cross Keys (15-0) March 16 to improve to 12-5 overall on the year. Towers remained perfect on the year at 6-0 overall and 2-0 in Region 5-AAA. Coach Sylvester Allen’s Titans claimed a pair of triumphs last week, easily taking care of Stone Mountain (19-1) March 14 and then pulling out a 9-8 thriller over Lithonia March 15. Towers received a strong pitching effort from senior Marcus Andrews in a 19-1 thumping of Stone Mountain March 14. Andrews allowed one hit and one earned run over three innings. Senior Terry Dennis (2-2; 2 RS; 2 RBI; 2 SB), Andrews (2-2; 2 RS; 2 RBI; 2 SB), junior William Booker (2-4; 2 RS; 1 RBI) and sophomore Keyon Swanson (2-3; 3 RS; 3 RBI) shined at the plate for the Titans in the contest. Druid Hills rounded out the list of undefeated performers from last week. Coach Pete Bartlewski’s Red Devils took care of North Clayton twice, winning 10-2 at home March 14 and then dumping North Clayton again on the road by a dominating 18-1 count March 16 to move to 6-8 overall. Senior Mason Curtis turned in a stellar mound outing for Druid Hills in a 10-2 triumph over North Clayton March 14, striking out 10 and allowing only four hits and one earned run over six innings. Junior Ali Desrochers (2-3; 2 RBI; 1 RS) shined at the plate. Junior Ga’von Wray posted nine strikeouts over seven complete innings, registering a no-hitter for Stephenson in a 5-0 blanking of Charles Drew March 13. Sophomore Shane Daley struck out six over 2 2/3 innings to help the Jaguars pull out a 5-4 decision over Mt. Zion March 14. Stephenson then dropped a tough 10-9 decision to Mt. Zion March 16, allowing two runs in the bottom of the seventh. Sophomore Ryan Ingram went 3-3 with two runs scored and two walks to lead the way offensively for the Jaguars. Junior Talib McDaniel-Burdeaux (2-3; 2 RS; 2 RBI; 1 SB) also collected multiple hits in the contest. Lithonia freshman Marcellous Allen realized his first career varsity no-hitter in Lithonia’s 20-0 thumping of Cross Keys March 14. Allen struck out nine over three innings. Sophomore Marquise Smith led the plate effort for the Bulldogs, going 2-2 with two runs scored and two RBI. Junior Eason Bing finished 2-2 with two runs scored for Southwest DeKalb in an exciting 7-6 decision over Miller Grove March 13. Senior Jeremy Hatchett earned the pitching triumph in the contest, allowing two hits and two earned runs over five innings.